Try our service with discount code "TRYME"
(*) Free 1 domain extension (.com, net, .org, .web.id, .my.id). cPanel have an advantage is that, cPanel is rich in features. These features and function help the users to manage their accounts. cPanel has a rich set of email management function. Getting to quickly and easily set up their email accounts. Easily to manage MySQL databases. So that even a new user can experience it without much technical knowledge. Collection of scripts with the integration of Softaculous. It contains around 400+ one click ready to use Auto installer scripts. thus the user can easily manage applications using simple scripts. 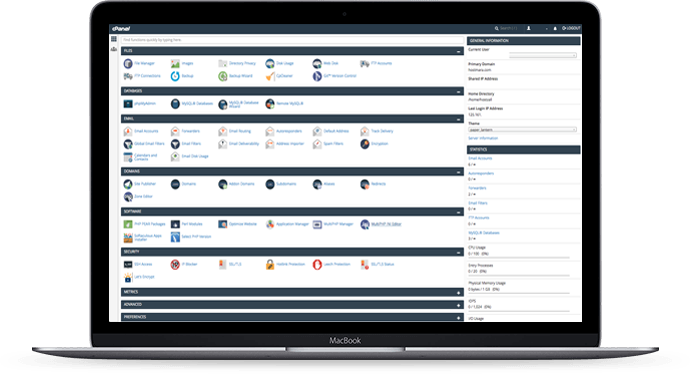 Easy to navigate, colorful, and vibrant client interface: cPanel offers a beautiful client-side interface and secured server protections. Need help? We are ready to assist you 24×7!